From The Daily Show to Hillary Clinton, Trump’s detractors have called his supporters everything from “racist” to “deplorable.” The allegations against the roughly 50% of the U.S. electorate that voted for Trump are not only legion, but dangerous. Reducing the biggest electoral upset since 1948, to the equivalent of the Beverley Hillbillies stuffing the ballot box is blinkered, and ignores a fundamental truth: voting isn’t a personal endorsement of a candidate. 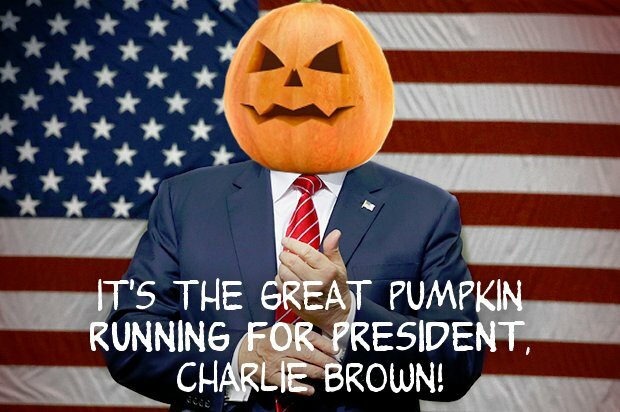 A vote for Trump was a vote against Clinton as much as an endorsement of the Great Pumpkin himself or any of his heinous policies and prejudices. If a vote for Trump is an endorsement of racism, sexism and Islamophobia, does that make a vote for Clinton an endorsement of murdering civilians and the Iraq war? In a two-party system (please don’t argue that someone who can’t name a world leader and another who thinks vaccines are health threats are viable alternatives) despising one candidate doesn’t equal a personal endorsement of the other, no matter how stupid their rhetoric. A large chunk of the American electorate voted for Trump, and it wasn’t because each one of them assessed and agreed with his misogyny, racism, prejudice and stupidity. Trump sold desperate people a story they’d believe, a better story than the other candidate did: vote for me and you get your jobs back. Falling for that doesn’t make someone hateful; it makes them dupes. Can you fault Trump’s supporters for voting in someone racist, sexist and everything else? Yes. Does that automatically make them racist, sexist and everything else? No. Neither Trump’s narrative nor the ensuing liberal whitewashing of theirs has much objective reality. As we’ll see in our next post, narrative is everything.